This week in KeratoScoop: Preparing for Dry Eye Awareness Month. Spring flare-ups. Saline mishaps. Keratoconus Family Symposium in NC. BostonSight advice for PROSE patients approaching cataract surgery. Subscription discount deadline. 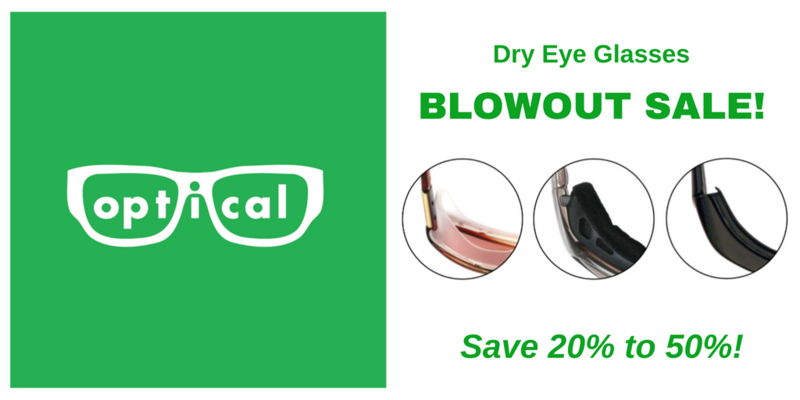 Dry Eye Glasses Blowout Sale. And yes, Refresh PM is still on backorder. Dry Eye Awareness Month: Prep time! Dry eye disease, with its heavy physical, emotional and financial costs, is affecting more and more people. Despite so many good advances in recent years, many people are not learning what they need to know in a timely fashion, either for prevention or for treatment. LET'S CHANGE THIS REALITY! July is Dry Eye Awareness Month and this year, we're not just blogging. We're going all out with a major public awareness and education campaign, and partnering with others who feel the same way. And we will need your help! PATIENTS and CAREGIVERS: Are you interested in supporting this effort? We have several ways. In terms of practical help, one of the best things you could do when July approaches is ask your eye doctor(s) to participate by posting links and distributing fliers in their offices. We will have a dedicated website for Dry Eye Awareness Month and some printed materials available. Monetary contributions would also be hugely appreciated! The Dry Eye Shop is just not able financially to cover all of the Dry Eye Zone's work these days (historically, that's how we've funded everything), and we really don't want industry money, so we're going to have to rely more on donations. Snail mailing checks is great, or you can send payments via PayPal to info@dryeyezone.com. More about supporting us here. We are not incorporated as a nonprofit, so donation are not tax deductible (sorry). DOCTORS: We'll be providing materials and messages and doing everything possible to make it easy for you to participate - we hope you will be part of this! Ways you can participate when July arrives: Links from your website. Sharing from your social media accounts. Sharing fliers with your patients. Stay tuned as we get closer, and please reach out with questions! Are you having a spring dry eye flare-up? You're not alone. I'm hearing from a great many people whose dry eye has tanked in the last two months. Even if you know you don't have allergies, please don't rule out the possibility that your eyes could be affected even if you the rest of you isn't. Ocular allergy and dry eye have the kind of complicated relationship that gives one pause when it comes to separating chickens from eggs. According to TFOS DEWS II (diagnostic methodology report section 9.1.1), dry eye can mimic allergic conjunctivitis; can even cause it; and oral allergy meds can induce dry eye. Several recent conversations have reminded me that I need to continue being a broken record about the importance of using preservative free saline to fill your sclerals, AND how to know if what you are using is preservative free. Here is the pattern I am seeing: New patient is handed their lenses and a little starter pack with some vials of Addipak. When those run out, patient goes to the drugstore and hunts in vain for the same thing. Not finding them, patient buys the saline that appears to be the most eye-friendly, such as B&L Sensitive Eyes - often at the recommendation of the pharmacist! If you bought it at the drugstore, it's not preservative free. The other common PF saline option for sclerals is sodium chloride solution sold for respiratory therapy in little pink single-use tubes, under brands such as Modudose and Addipak. These are very difficult to find locally, and Addipak requires a prescription. June 23, 2018 - NKCF Family Symposium (Chapel Hill, NC) Yours truly gets to go speak at this one too - can't wait! Hope to see some of you there. PROSE USER GROUP on Facebook! We have a brand new group, an offshoot of the My Big Fat Scleral Lens group. The new group is intended specifically for current PROSE users. I love how the new updated Tranquileyes + Beads and/or Instant kits have MORE of everything! For those who like a really nice luxurious warm or cold compress... this is the way to go, especially now that you get more for your buck with all the extra hot/cold packs. Sold in two sizes... regular in the top row, extra large in the bottom row. Refresh MEGA 3 is back. Refresh PM is still on backorder. Systane Complete... I had a look at this new drop and it's got exactly the same ingredients as Systane Balance but it advertises "nano droplets". Hmmmmm. Show your doctor a product you're using that you got from the Dry Eye Shop. If there is an article on DryEyeZone or DryEyeShop that you have found helpful, print out a copy and take it to them (along with the link where they can find it). If you were referred to us by your eye doctor, consider asking them to link to us from their website! This section of KeratoScoop is dedicated to messages direct from BostonSight, providers of PROSE and BostonSightScleral. It is not unusual for patients wearing BostonSight® PROSE devices to require cataract surgery. Over the past decade we have had substantial experience with PROSE patients with ocular surface disease or ectasia/irregular astigmatism who require cataract surgery, and wish to resume wear of their PROSE device as soon as possible post-op for comfort, vision, or both. If you are considering cataract surgery, we have a document we can send directly to your surgeon that discusses surgical techniques, post op medications and post-op refractive error. If you or your surgeon have any questions related to cataract surgery in a BostonSight® PROSE patient, please feel free to contact our medical staff by telephone 781-726-7337. Travel Tip for Needham PROSE patients who plan to travel out of the United States. A reminder to obtain a travel letter from BostonSight for your solutions. Purilens has been known to be taken by the TSA. We’d instead recommend using smaller, packaged solutions like SccleralFil, LacriPure and Sodium Chloride. Last Monday's SBA class was really good... it was the first section of the financial module. Thanks to already having put in a lot of work on the side, including with someone from the small business development council, for the first time I actually knew more than some of my classmates, which was a refreshing change! We were each given a report with a ton of financial data specific to our individual business areas, and I found it extremely helpful to be able to look at my business in the context of those broader trends. Most of all I think it gave me a keener sense of more of the factors completely outside my control that have been affecting us in these last couple of challenging years. The hardest part of going through our lean times is that we will occasionally be out of a product that we know is important to our customers, and I really really hate that. We'll be doing our best to keep the impact to a minimum and always refer you to good alternative sources when we can't provide what you need. After Lindy's last day I marked 3 weeks on my calendar as "Hell weeks" - the weeks between when Lindy stopped and when Aidan starts. And yes, they pretty much were. But the silver lining has been that since I'm manning the phones entirely myself right now for the first time in a very long time, I get to reconnect with callers and customers, and I'm enjoying it tremendously. Hearing a lot of voices that I know but haven't heard in a year or two! Catching up on people's lives and stories and eyes! I also just really appreciate getting a more immediate sense of trends going on. - By the way, Lindy, thankfully, is still doing bits and pieces for me on graphic design and such. So with our cashflow super tight right now, I don't quite know what the summer holds but I will have as much of Aidan as I can afford between now and the beginning of August when he heads to Europe for some travel time and then to his semester abroad in France. I'm going to give him as much phone duty as possible so that I can get my own work done, so lots of you will get to "meet" him over the last couple of months. - Meantime, my brainstorm buddy Espen will also be popping in when I can manage it, for some of the long-term products I'm working on and hopefully for some help on Dry Eye Awareness Month. My really exciting staff news is that my daughter Chaidie just joined us. [Spoiler alert: maternalism] Chaidie is one of those teenagers where you scratch your head wondering how you could possibly have won the parenting lottery. [/bragging] It's exciting to have her in the office and as time goes on I'm sure you'll be hearing more about, and possibly even from her. Air conditioning is already at full blast in some parts of the country, and lots of you will be outdoors a lot this weekend. Wraparound sunglasses are your best friend - especially if they are the foam-lined type (e.g. 7Eye AirShields) that can keep you truly windproof. As always when you're in environments that are rough on your eyes... drink up, lube up, and cover up! Have a terrific holiday weekend, everyone!